Former gay lovers Shane and Pitch reunite after years apart and try to heal the wounds of their past. Shane is haunted by the tragic death of his daughter, while Pitch suffers a grave illness, rejecting medical treatment as painful and ineffective. Pitch creates beautiful structures of flowers and banana leaves, as a way to cope. Meanwhile, Shane trains to become a Buddhist monk, to build karma for Pitch to either keep him alive or to help in his afterlife. 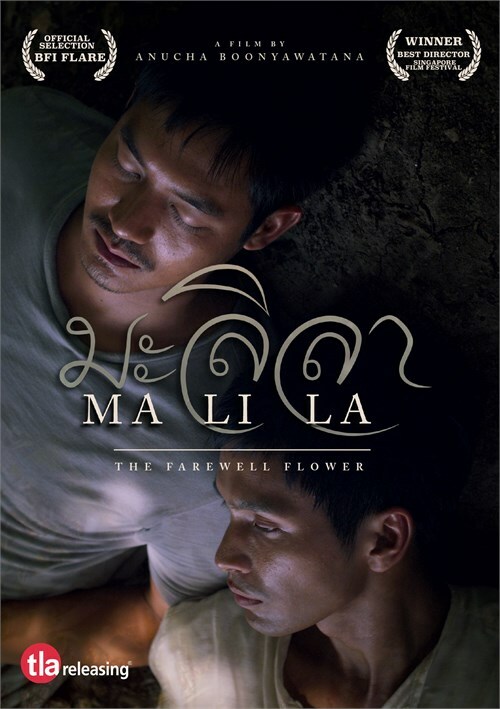 A remarkably beautiful, spiritual film, Malila: The Farewell Flower is as close to transcendent as cinema gets. terminal illness, Buddhist philosophy, the therapeutic power of art and gay romance. Shane (Sukollawat Kanarot) is deeply affected by his separation from his wife and the death of his daughter. Then his friend and former lover, Pitch (Anuchit Sapanpong), is diagnosed with terminal cancer. Although Shane does not know how to handle this news, his companion seems calm and accepting in the face of his imminent death. As the man's illness progresses, Shane is reunited with his lover and becomes more and more determined to continue his life as a Buddhist monk. There is great beauty here and it begins with tranquil, soothing visuals and smooth transitions. It brings a gentle, reassuring touch to the grim, harrowing topic of death. The frames seem to flow effortlessly together as we become immersed deeper and deeper into the narrative. The script does not only deal with loss; it also looks at the ephemeral nature of existence and the inevitable pain that comes with grief. It also takes on issues like chronic illness, frustration, uncertainty and the peace found in companionship. It seems to be something of a pleasant handbook of mediation, where we see the main character's transformation as he picks up and dedicates himself to his meditative practice. The Thai Bai Sri ornaments are of central importance to the film. The film raises the question of the real meaning to life. Pitch is often found spending his remaining moments working on an ornament from interlaced jasmine flowers and banana leaves. "The metaphor is the same ? is there any purpose in life or any reason to do anything as long as everything is wiped clean by death in the end?" What the monk's ritual shows is that life is temporary and ultimately destroyed, the process of creating it, improving it and patiently putting it together is beautiful, whole and a reward in itself. The fact that it disappears is of no relevance to its delicacy and importance. This is the lesson Pitch seems to learn as he becomes fully absorbed in Buddhist practices. The film is filled with dreamlike scenery, serene moments shared between characters and an overall sense of peace that transcends any imagery or dialogue. However, Boonyawatana does not avoid the crude reality of death. There is a scene which depicts a rotting corpse without any embellishment and it reflects the emptiness and utter silence that surrounds the dead body. This us to face our own mortality, not only as some abstract, distant idea, but as impending reality. The movie does not only explore the surreal experience of confronting one's own death, but also how loss and grief affect others who stay behind. Shane's perspective and hardship in dealing with his friend's unavoidable death is equally as important as what Pitch goes through. Boonyawatana uses a gentle and contemplative perspective to show that we can find peace in the darkest of times and nothing can prepare us for the feelings that come with death. "Malila" is spiritual meditation on life, love and death centred around the potency and purity of Jasmine. Filmmaking wise, we have seamless editing, breathtaking cinematography, accomplished lighting and, a sparingly-used soundtrack. But, The actors are the real here. Even when we feel the horror of death, there is a sense of serenity and the grotesque becomes beautiful. You cannot just walk away from the film when it is over. It will stay with you for quite a while.